Most of us have who have multiple media players installed on their computers would have probably experienced that irritating moment when you open a new media file and you are required to choose from the various media players installed on your computer. This is an problem that will keep on occurring every time you open a new media file type on your computer. But you don’t need to worry, Like every other operating systems, windows even has an useful feature up its sleeve that will let you choose the default application for opening any specific file type. Courtesy of the Default program feature in Windows, you will be able to select a program for opening specific file types or decide what file types can be opened by a program / software . Here is how you can set default programs for opening specific file types on windows. Step 1: Go to the Start menu and search Default program in the search bar. 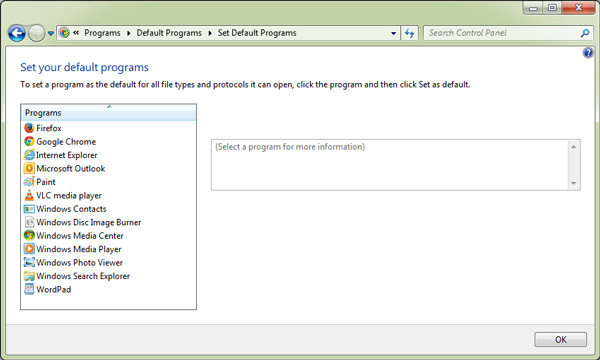 Step 2: Click on Set your default program and wait for a few seconds for the default program menu to open. 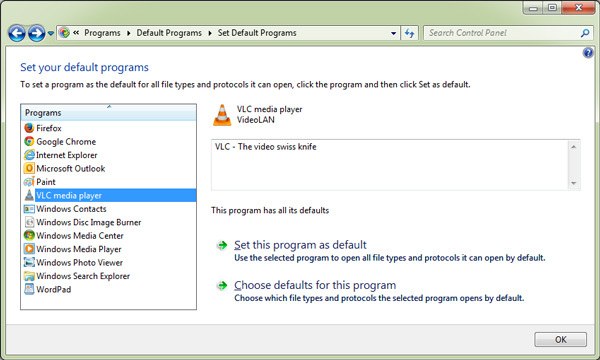 Step 3: For this guide we will be taking VLC media player as an example. Select VLC media player and you will see the following options appear. Step 5: Click on Choose defaults for this program to select specific file types that you want VLC media player to open by default. That’s it, now you can follow the same process for other programs and choose the default files types that each of the programs can open.